Close die Forging is a plastic deformation process where, unlike in the open die forging process, the material is forced to flow in a closed shape called die. Compared to the open die forging, the close die forging (said also hot drop forging) can achieve more complex geometries, very much close to the dimensions of the finished component. The plastic deformation is given rapidly through some shots which force the material to fill the shape of the die. The process is performed at the plastic temperature of the material in use without intermediate re-heatings. A key step in close die forging is the design and the production of the dies, process which is part of the know-how of the manufacturer. Unlike the open die forging, suitable to manufacture also individual parts, the close die forging is used to manufacture series production as this is particularly convenient to absorb the costs the dies. In our case we are talking about close die forging of carbon, alloys and stainless steels in the range of 1 to 70 Kg per unit, in series of 150 to 5.000 parts; downstream processes like heat treatments to achieve the required properties and machining are performed as required. The close die forged product shows several advantages like the typical flow lines of the material along the profile of the component, beneficial particularly on mechanical components put in service under cyclic fatigue. This process allows furthermore to use reduced over-dimensions, feature which allows cost savings on input weights as well as on final machining due to less material to remove. 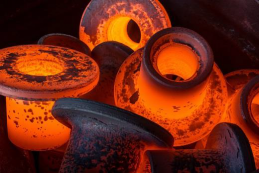 The close die forging process is typically used for critical components, in our case on railway, petrochemical, electrical, lifting and safety system, industrial and agricultural machinery sectors.